Photo sent to us by Dale Russell, Scottsdale, (USA) dated 1916. The man in the driver's seat was his grandfather. He was born in America but lived and worked for most of his adult life in South Africa, specifically Johannesburg. Dale thinks his preference would have been for an American or possibly British manufacturer. Do our members have any ideas what the make and model may be? -- Neither, but French. Side mounted radiators indicate cca 1902 Renault 8HP Tonneau. 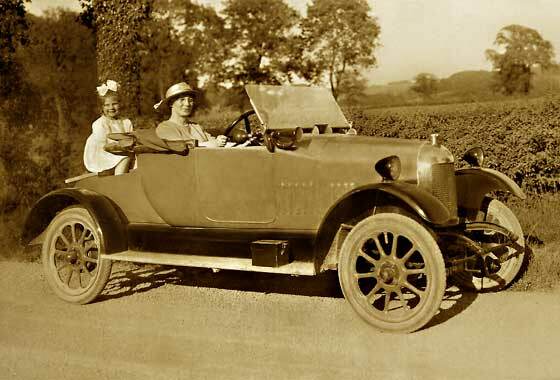 Photo recaived from Peter A Forbes (UK) asking if we can identify the car driven by his grandmother, (then Miss Phyllis Allen), who he believes was the first woman to hold a driving licence in Essex. The photo was taken probably 1910/11. When were driving licences first introduced in the UK? 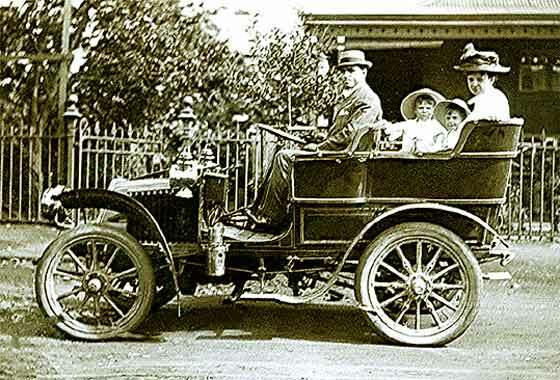 -- Licences were introduced in 1903 via the Motor Car Act. Car registrations followed the following year. The car is a cca 1903 De Dion Bouton. P 144 was issued by Surrey County C early 1904. 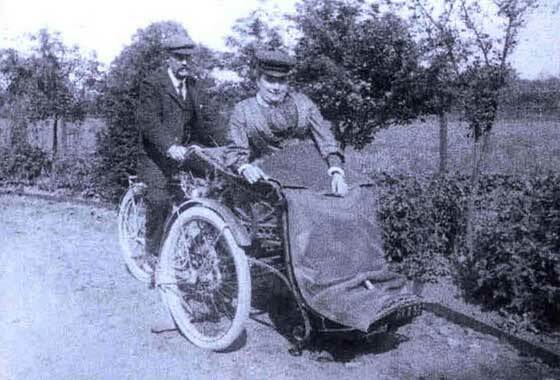 Photo sent to us by Mrs Ann Viney, Bordon, (UK) showing husbands grandfather driving and grand mother in the chair. They lived in Headley and she wondered if they had a day at Southsea and hired the vehicle? -- BK 238 was issued by the Portsmouth CBC but dating records have been lost. The all important motorcycle is hidden by the forecar. Not normally possible to identify bikes from forecars as bodies would have been made by external coachwork companies. Probably 1905 /06 /07. Photo received from Andrew Rusack (UK) asking if we could identify his Great Grandfathers car. GG was Wilhelm J C Rusack who was the founder of Rusack's Hotel in St Andrew's, Fife. The photograph was taken outside Rusack's Hotel garage c1905. -- Bit later. 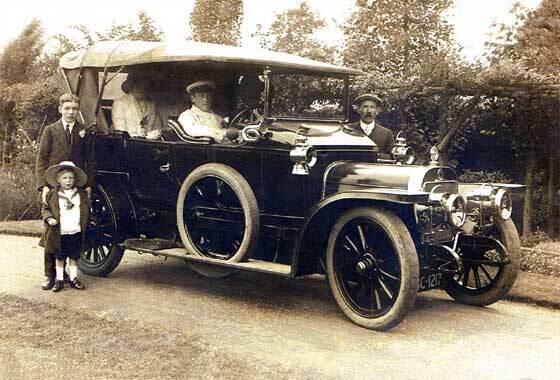 Early Fife registration details have been lost but from shape of the radiator this car was made in Glasgow, Scotland, being a cca 1907 Albion 24'30 Landau. Became Leyland in 1951, and Albion lorries were made to 1972. Recently contacted by Stanislav Kiriletz relating to his enquiry in 2005 on a double decker bus at the St Petersburg Exhibition in Russia in 1907. We had no positive identification but suggested a bus made by the London General Omnibus Company (LGOC). Stanislav has obviously been investigating his photo further and replied with the following comment: " Identification is not correct! Now I know answer! It is not AEC, it is Hallford (Licence of Swiss lorry Saurer) ; body of Liversidge. More photos received from Jim Derham-Reid from British Columbia (Canada). Low resolution photos make identification frustrating. Grandfather Thomas Forrest Liversey bought a Gobron Brillie without a body in 1912/13 and designed a body for it. Family believed it was a G-B because Gramps said so. -- One thing all our experts seem to be agreed on from the rad is is that it is not a Gobron Brillie. I note that badge and odd filler cap match. John Warburton wonders a Crossley? 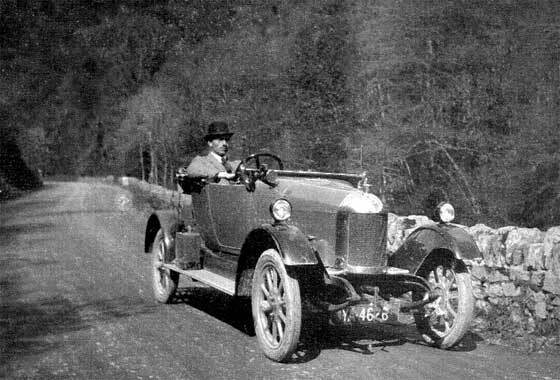 Interesting photo sent to us by Nick Butler (Australia) of a car driven by his grandfather (as chaffeur) when he was about 19. The photo was dropped by grandfather at the battle of Messines (about 7th June 1915) and picked up by a soldier from Belfast. It was returned to grandfather 14 years after the war. -- Registration BC1217 is a Leicester County Borough Council registration but dating records lost. 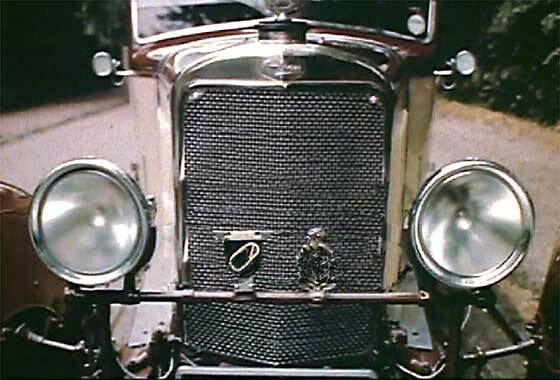 Bulkhead suggests car is a Scottish cca 1911 Argyll Light Fifteen Tourer. Photo sent to us by Anthony Darling (UK) who is currently digitising the family photo albums of his and his wife's families. 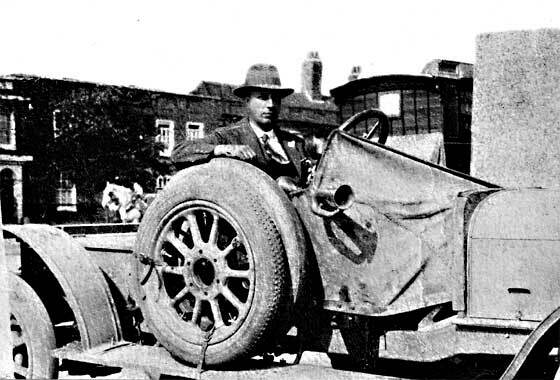 This photo shows his grandfather who was employed as a chauffeur/mechanic in the 1920's and 1930's to a wealthy family who lived in Redcliffe Gardens, Kensington, London. 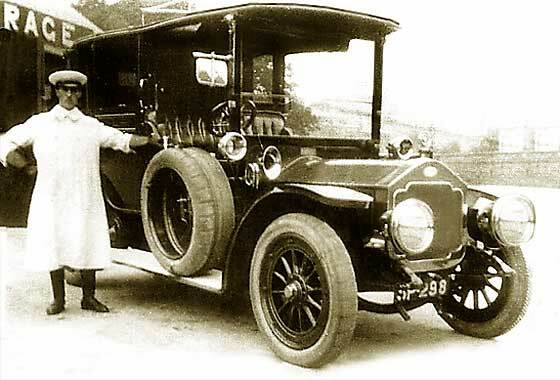 -- This is a rather nice Belgian car, a cca 1914 Metallurgique Landaulette, which was to be, but was not, made in England. Registration is early 1914, issued by London County Council. 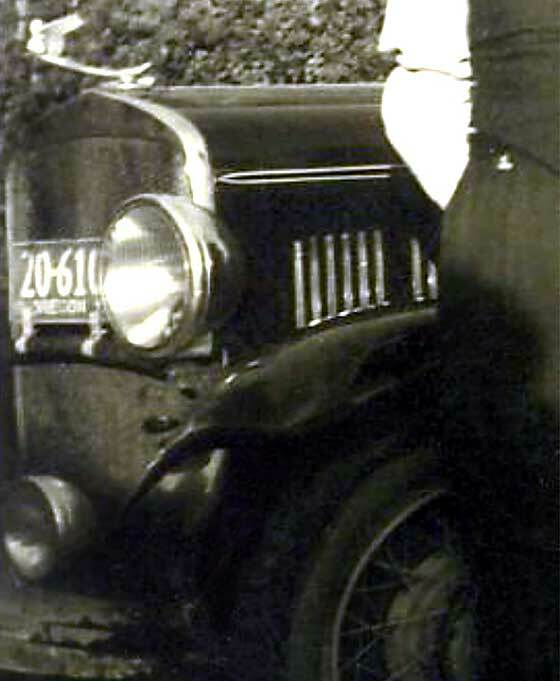 Another cinema screen grab of a vehicle which appeared in an American film " Mata Hari " made in 1931, where the vehicles are being investigated by IMCDB. Said to be Greta Garbo's greatest film - based on true life story of the exotic German spy, Mata Hari working in Paris. -- Actually quite a difficult car to identify as it looks American but supposed to be European. John Warburton eventually identified it as such, cca 1916 American FIAT Model 55 , made in Poughkeepsie, USA. Photo sent to us by Anthony Darling (UK) who is currently digitising the family photo albums of his and his wife's families. This photo shows his grandfather who was employed as a chauffeur/mechanic in the 1920's and 1930's to a wealthy family who lived in Redcliffe Gardens, Kensington, London. -- This is a rather unusual early Bentley, a cca 1923 Bentley 3L Tourer, which seems not to have the standard Vanden Plas body. Bentley deliveries started in 1921, - so within first 300 cars. 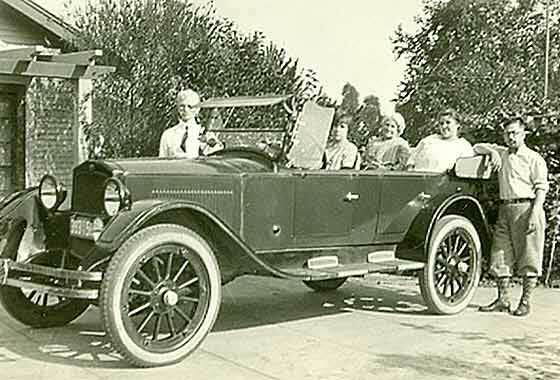 Interesting photo sent to us by Gretchen Anderson, Bellingham, WA (USA) from a diary of great aunt's road trip from Chicago to Los Angeles in May 1923 (there were 6 people in two cars). It took them an entire month going about 100 miles per day. None of the photos are identified. -- Nobody could crack this one either side of the pond until a lead from Dr Watson of AACA. Not a positive ident, but we are almost sure it is a cca 1922 Kelsey 5 Person Touring, made New Jersey 1920-4. Photo sent to us by Linda Cox (UK) who has "just found our brilliant website" and who is currently researching a very well looked after Victorian/Edwardian family photo album. 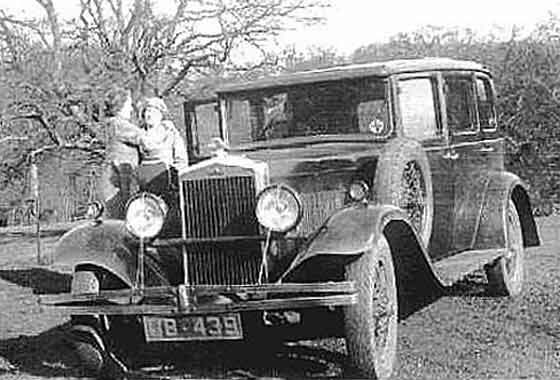 The owners of this car were very wealthy newspaper owners who lived in North West Leicestershire when this photo was taken. -- Registration is not visible but we can confirm from the small headlamps on the wings there for two years only, and a bullnose rad, that this can only be cca 1922/3 Morris Cowley. Photo sent to us by Brian C Warren (UK) recently found in one of his mothers photo albums. She died 8 years ago and there are no relatives alive in that generation. He does not know who the driver is, the make of the car, or where it was registered. Can we help us trace the owner please?. -- We can advise that the car is a Morris Cowley Two Seater and that the registration was issued by Somerset County Council in very early 1923. Only the DVLA may be able to help tracing original owner. 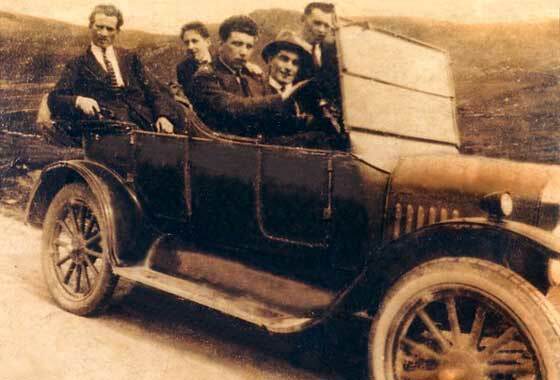 It is interesting how often pictures of groups in cars are taken without showing the radiator. Quite obviously people are more important than cars (sometimes!) but it does not help with identification of the car; such as this photo from Caoimhghin O Croidheain (Eire). Photo taken in Kerry, Ireland, is of his grand uncle driving what was thought was a Crossley Tender, told since that it is not. Would you have any idea what car it is? It would help date the photo. -- cca 1923 Ford Model T Touring. Photo sent to us by Trevor Harvey (UK) asking if it is possible to identify this car. I friend thinks it may be a bullnose Morris but Trevor is not so sure. The photo was taken at Ottershaw on Fletcher land by the Fletchers. Unsure of the people names but lady on left looks like his grandmother Harvey, could be visiting the Fletchers. 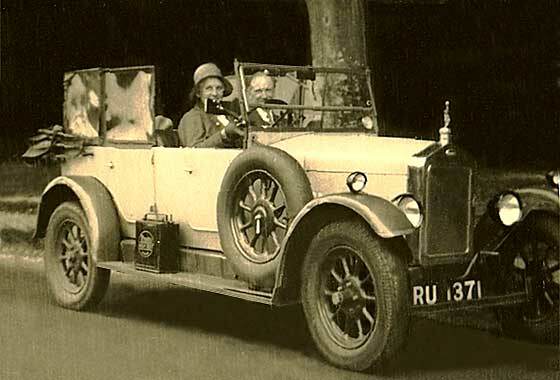 -- The registration is Essex CC issued in 1925 but by the starting handle arrangement the car appears to be a cca 1924 Jowett Model C Tourer, possibly the 7/17. Photo sent to us by Nick Booker (UK) asking if we can identify the car containing his grandparents (neither of whom could drive! ) photographed late 1920s/early 1930s. The registration is Bournemouth CBC (they lived in Poole) but precise dating records no longer available (November 1924 - July 1929). Could be a 1925 Wolseley although the radiator mascot looks wrong but this could be a personal one. -- No front brakes so yes, cca 1925 Wolseley 11'22 Tourer. Bugatti mascot? Photo sent to us by Brian Pritchard (UK). It was taken in the late 20's in Dwygyfylchi, near Penmaenmawr, Caernarvonshire [now Gwynedd] North Wales. It shows his grandfather, who was a chauffuer to Sir Thomas Artemus Jones J.P. [1871-1943]. Look forward to finding out the make and model. -- Four louvers on the bonnet so this is a cca 1925 Wolseley 15 Tourer. Wolseley initially sheep shearing machines. 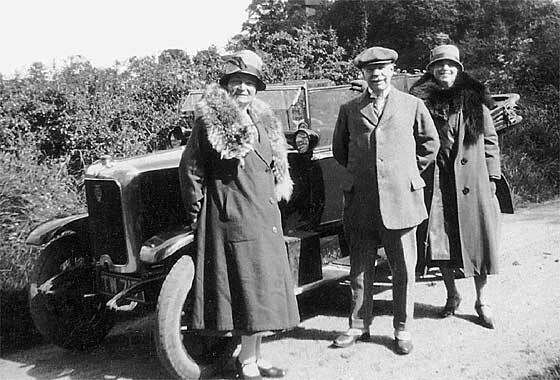 Vickers bough Wolseley motors 1901, and Morris bought them in 1927. 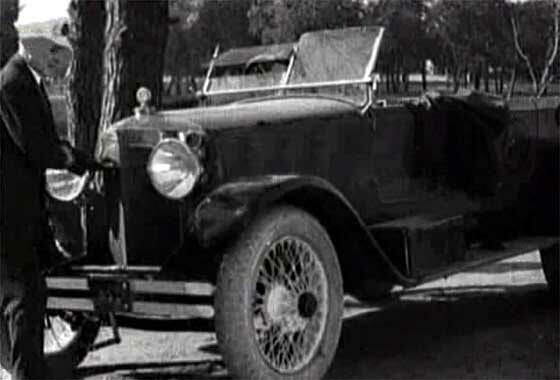 Another cinema screen grab of a vehicle which appeared in an American film " The Betsy" made in 1978, where the vehicles are being investigated by IMCDB. The plot involves a family automobile manufacturer who pin their hopes for a return to profitability on a new model. Said to be based on some members of the Ford family of Detroit; obvious parallel is apparently Olivier playing a Henry Ford like character. 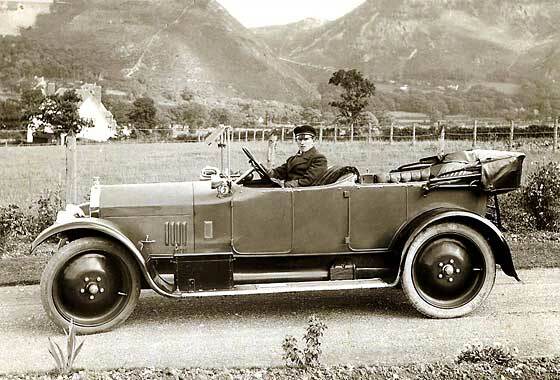 -- This car is a cca 1925 Sunbeam 3LTourer, from Britain. 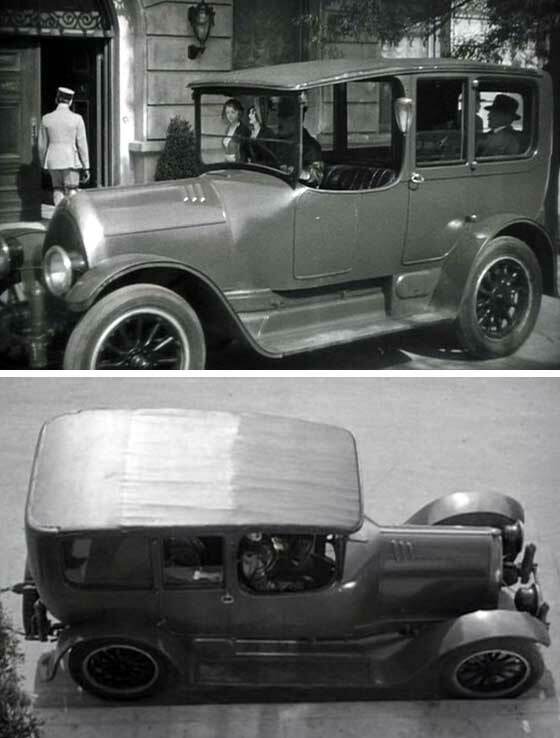 Another cinema screen grab of a vehicle which appeared in a Russian Film " Miss Mend" made in 1926, where the vehicles are being investigated by IMCDB. The plot involves three reporters and an office girl trying to stop a bacteriological strike by powerful western business leaders against the USSR. 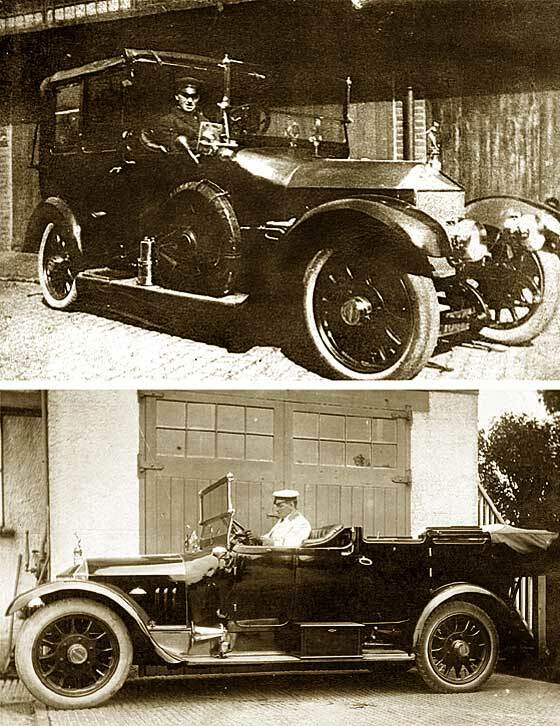 -- This car was made in Austria and new when the film was made, being a cca 1926 Austro Daimler 617 Tourer. It seems to sport the then very fashionable Tulip Phaeton bodywork. Another photo sent to us by Dave McDonald (UK). He has just received this photograph of his wife's Great Great Aunt and Uncle. There is no date on the photograph but both of the people were born in 1870, so it was probably sometime in the 1920's or 1930's. 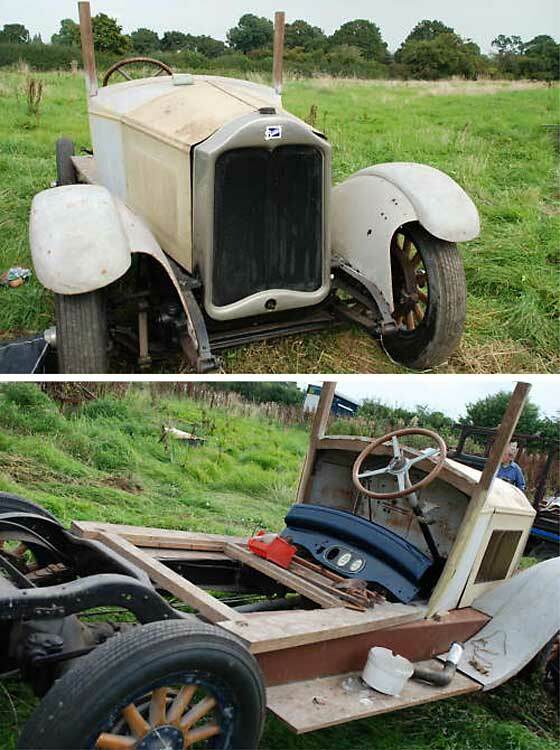 -- ' Diddy' car so has to be a cca 1927 Austin 7 Top Hat Saloon. 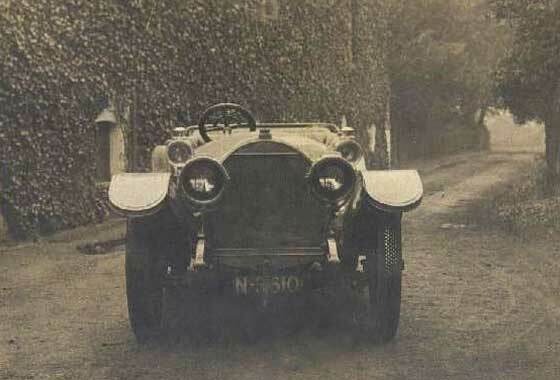 Called 'Top Hat' because of upright, formal straight-sided coachwork, panelled in aluminium to save weight, and with elaborate cloth trim unusual at time. Bulkhead lights. Photo sent to us by Phil Haywood, Burton-on-Trent (UK) saying he recently acquired this Buick rolling chassis with a story that it was once used to mow the grass on a golf course and a deceased gentleman in Yorkshire did the restoration work. Does anyone remembers the car or owner? There is no number plate or paperwork so any info would be appreciated. -- Radiator is of the 1928 pattern but nothing about the back end suggests it was ever a lawn tractor ! Google: Pattison tractor. Sometimes our enquiries are made doubly difficult by being unclear or small. Occasionally we only get a part of such a photo, and without background: "attached photo might have been taken around 1930, but that's only a wild guess judging by possible ages of my relatives. Does the photo provide enough clues for an identification of the car? Wes (Australia). -- Well, an incorrect broken mascot does not help, - but from the louvres we can advise the car was a USA cca 1929 DeSoto Six. More photos received from Jim Derham-Reid from British Columbia (Canada). Unfortunately all photos are received in near lowest resolution possible which makes identification frustrating. 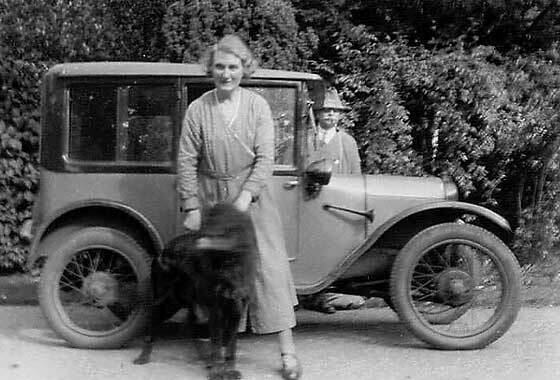 This photo is of his Grandmother next to what his mother thought was an Austro Daimler, in Cheshire. -- Sorry, no. This is a Morris, a British car, which Chas Moody confirmed as a cca 1931 Morris Oxford Six Saloon. The badge on the radiator is a winged symbol which was used only 1930/1. Photo sent to us by Donnie Osborne (USA?) asking our help in identifying his father's car. 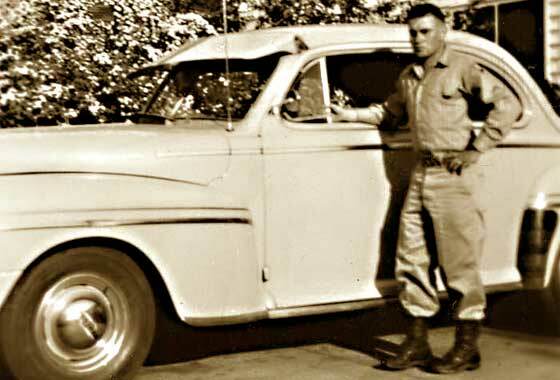 He is putting together some scrap books with newspaper clippings, letters, and photos but doesn't know much about old cars, Picture was taken ca. 1950 and father passed away last October. Mom is in a nursing home and cannot help him. -- Our friends at AACA were able to pinpoint the car down to a 1947/8 Ford Mercury Coupe from the beltline trim quarter way, instead of going to the end. Photo sent to us by Anthony Darling (UK). Wife's grandfather sitting in what could be a Napier car. Grandad worked as an export salesman for Napier and took a car on a sales drive to South America, mainly Argentina, probably not this one. -- Very little to see but our John Warburton doubts it to be a Napier. The double drop chassis suggests late Edwardian for formal coachwork or taxi. 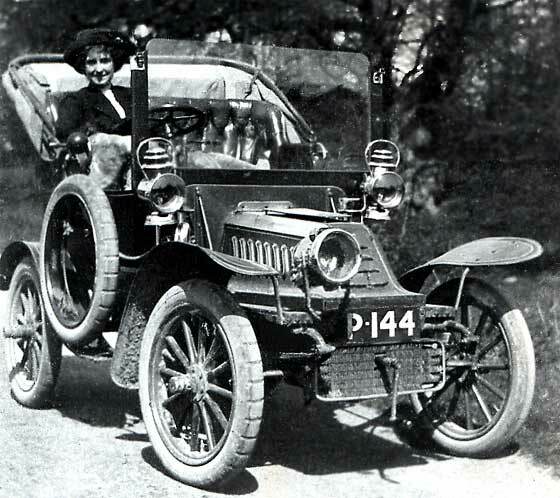 Mudguards and bonnet 1910, and 6-bolt detachable steel wheels 1919; Austin is a possibility?